I remember cooking roties or parathas all together during any family functions for the big count. I like preparing roties / parathas when there is a crowd at home. So that one can make a dough, other can prepare the filling. The other two can work on rolling parathas and cooking part. It doesn't need any side dish, but very satisfying with plain yogurt and pickle. I make good shaped stuffed parathas. But this time, I was not able to make good one. Also as an additional disappointing factor, It started raining after I made a setup for clicking and I was forced to click it with poor day light. As an impact of it, you see slight shaky picture everywhere here. 1) Peel the skin of bottle gourd remove the inner parts. Grate it using the grater. Add salt to taste and mix it well. Keep aside for 5 minutes. 2) After 5 minutes, grated bottle gourd started leaving water from it. Squeeze out the water and leave bottle gourd alone. Try to squeeze out as much as water you can. Keep the water for making dough or you can even discard it. 1) In a mixing bowl, take wheat flour. Add milk, red chilli powder and the Juice extracted from bottle gourd. Mix well. Add salt if you are not using the bottlegourd juice as we already added salt to it. 2) Start making a dough. Add water little by little if you require for making soft and smooth dough. 3) Knead for few minutes and keep it aside for 15 minutes. Meanwhile, prepare filling for the paratha. 1) Heat oil in pan. Throw cumin seeds and let it crack. 2) Add grated bottle gourd. Mix well. Add red chilli powder and turmeric powder. Taste and add salt only if required. Remember we have added salt before cooking the bottle gourd in the initial preparation..
3) Cook till the bottle gourd becomes soft and no trace of water found. 4) Let it cool for sometime. Use it for the paratha. 1) Divide the filling to equal parts. According to the filling, divide the dough into equal sized balls. I was able to make out 6 balls. 2) Roll a ball into 3-4 inch round size and place a filling to the center of it. 3) Gather the corners and seal it properly. 4) With the help of flour, roll it into 7-8 inch circular paratha. 5) Repeat the steps for remaining dough. 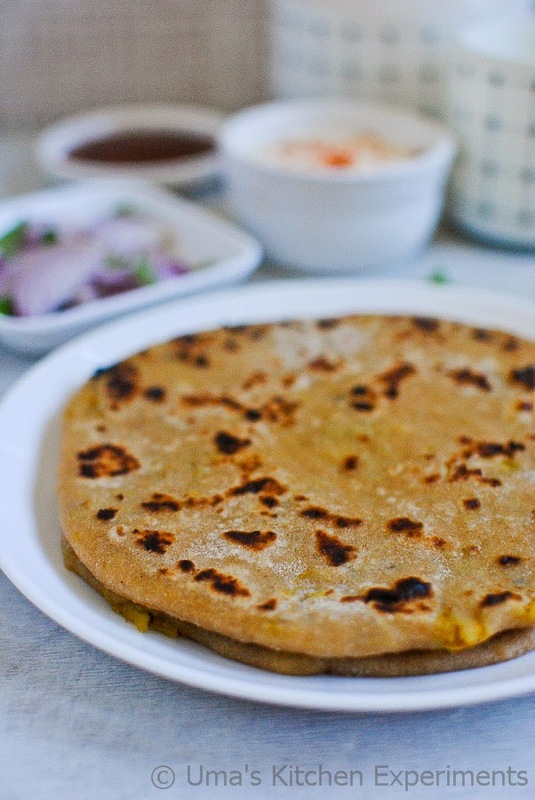 6) Heat skillet and carefully place the rolled paratha to it when it is hot. Smear it with ghee or oil on the surface. 7) After few seconds, Turn to other side to cook other side. 8) repeat the steps for cooking remaining parathas. 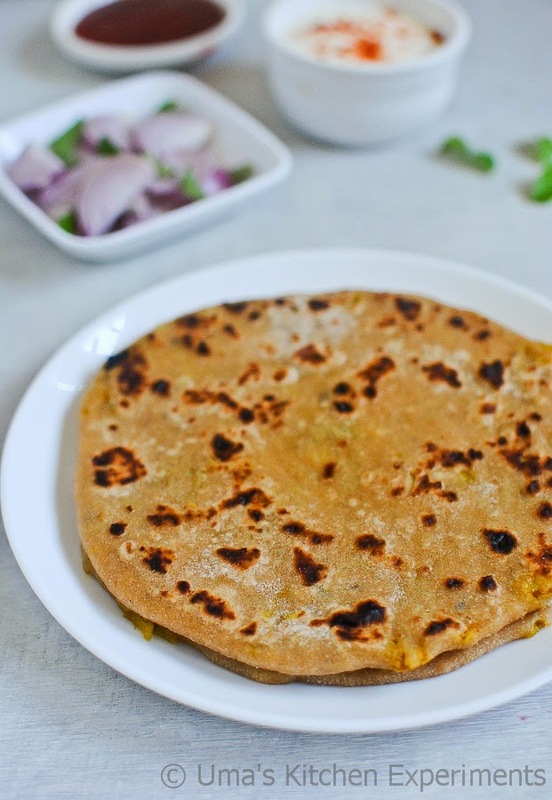 9) Bottlegourd paratha are good to have with curd and pickle. 1) Since we already added salt to the filling to squeeze out the juice from it, it might have limited quantity salt in it. So taste the filling first and adjust the salt accordingly. 2) Save the peeled bottle gourd skins. We can use this for making a condiment that I'll be sharing soon. 3) Make sure to squeeze out the water properly, otherwise, you may not roll the parathas properly. If you see some water quantity even after squeezing out the water and cooking, prepare parathas this way. 4) Finely chopped onion and garlic can be added to the filling. 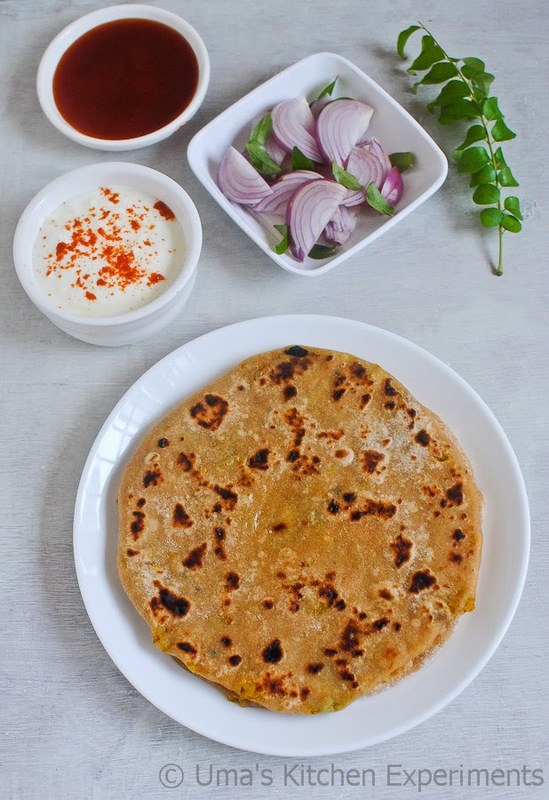 Lauki parathas look so delicious and wholesome. Wonderfully prepared. healthy start for the week. I always struggle to get the shape due to the water content.. Perfectly done.. 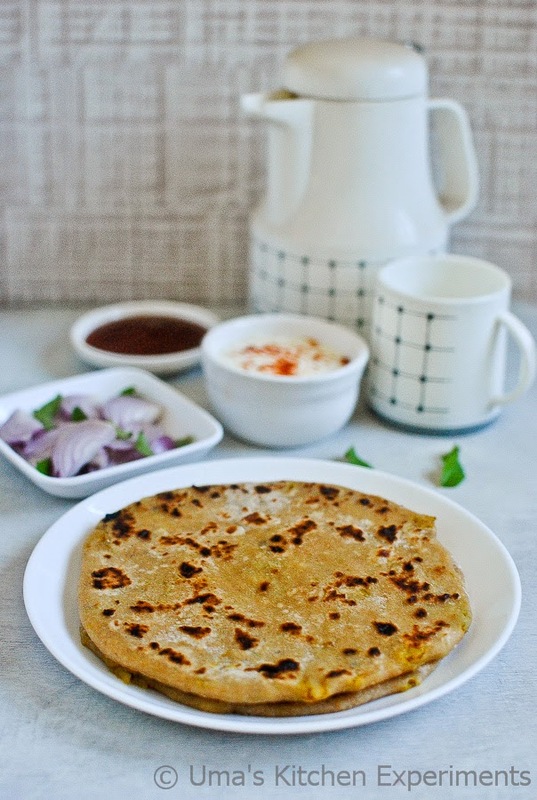 Delicious paratha recipe Uma :) love all the clicks. lovely m making this for sure for breakfast tomorrow..
jus grt uma.. unique one..